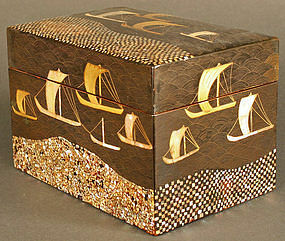 19th Century Meiji Period Black and Gold Lacquer Box. Features a stunning design of wonderful lacquer techniques. Though large it is very delicate in its presentation of leaves, flowers and branches. 13.75w x 11d x 6h inches, 35w x 28d x 15h cm. A unique early Edo Period 17th Century rectangular Lacquer Incense Box, with high relief and decorated with Gold Takamakie technique on thick Nashiji ground. Takamakie is a kind of relief combined with the Hiramakie technique. The base of the relief is made with charcoal powder. Hiramakie is　sprinkling metal powder or grains, sticking them onto the surface, using the adhesive ability of urushi tree sap. For sprinkling metal powders puffy raw silk threads are used while for grains a thin bamboo cylinder filter is used. The makie parts are whetted or polished after drying. Makie technique is indigenous to Japan. 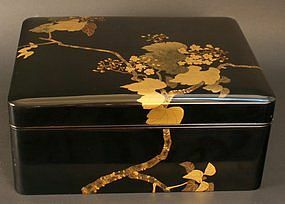 This fine box has an image of a tied pouch and thickly raised objects and flowers on a Nashiji (pear skin) sprinkled gold lacquer ground with details of kana-gai (pieces of gold or foil embedded in the lacquer). A magnificent work of art. It is rare to find such early lacquer in such excellent condition. 6.5w x 3.25d x 2h inches, 16.5w x 8d x 5h cm. 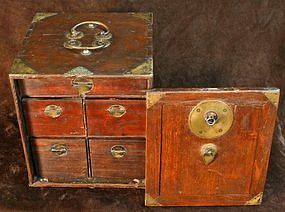 Meiji Period Japanese Safe with Drawers and Handsome Butterfly and Floral Metalwork. 13.5h x 12.5w x 12.5d inches, 34h x 32w x 32d cm. 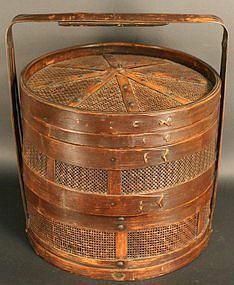 Antique Japanese Bamboo Steamer with two sections and a large bamboo handle. The lid and top section are removable. 17.5 inches (44.5cm)h x 16 inches (40.5cm) wide. Very Rare and Fine Antique Japanese Basket by Suiko. Top Quality Artistry and Workmanship. This very basket is often imitated (the greatest form of flattery) and is widely known because of the copies, but now you have the rare opportunity of owning the signed original. Truly a remarkable find. 20 inches (51cm) high x 10 inches (25.5cm) wide. 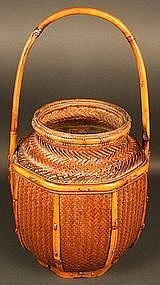 Museum Quality Japanese Basket by Kosuge Chikudo. The highly regarded master Chikudo's baskets are in museums in Japan. This very fine, masterful example of his work is a rare find for the serious Japanese basket collector. 17 inches (43cm) high x 9 inches (23cm) wide. 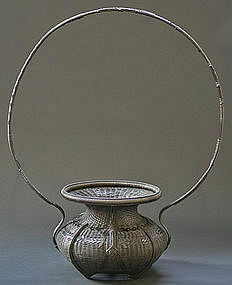 Japanese Antique Ajiro Kago (Bamboo Fishing Basket) with an elegant form and design, signed by Kazuhiro. 18 inches (46cm) high x 6 inches (15cm) wide. Rare Bamboo and Bamboo Root Antique Japanese Fishing Pole converts to a Cane carved with a playful Monkey and Snake and auspicious symbols. The 35 inch ((89cm) walking stick extends to an 83 inch (211cm) fishing pole! A unique find for the collector of Japanese art. Japanese Antique Walking Stick of Bamboo and Bamboo Root with a wonderfully carved Shangri-la scene depicting a goddess' arms extending to reach the Heavenly Peaches of Immortality. A fun and delightful work of Japanese art that you can take with you anywhere you go. 35.5 inches (90cm). Antique Japanese Linen Banner Commemorating the pivotal Kawanakajima War of the Sengoku Period, a period rich in samurai history. War ships are depicted bearing the crests of the Takeda, Maeda, and Kato clans. A vibrant and powerful piece of Japanese history. 70.5 x 30.5 inches, 179 x 77.5 cm. 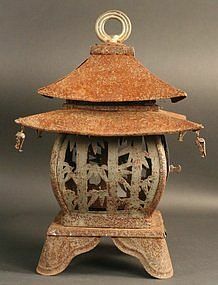 Yukimi Gata Toro (Lantern for Snow Viewing) that was used in the winter. Iron and Sheet Metal with a very rare Double Roof design. A rare and unusual Edo Period example for the serious collector. 12.5 inches (32cm) high x 10.25 inches (26cm) wide. 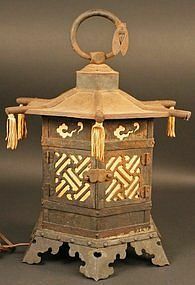 Yukumi Gata Toro (Lantern for View of Floating) that was used near water. Iron and Sheet Metal with a very rare Double Roof design. The door panels are in the shape of bamboo trees, the ancient Japanese symbol of resilience. A rare and unusual Edo Period example for the serious collector. 15 inches (38cm) high x 10.25 inches (26cm) wide. 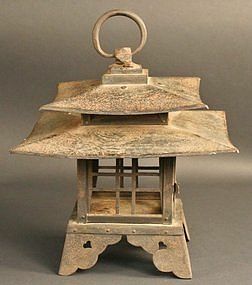 Rokkaku Roukaku Sansui (Fine Hexagonal High Building) Japanese Garden Hanging Lantern of Iron and Sheet Metal with a lovely Cicada on the roof hoop, symbolizing Summer and the brevity of life, reminding the garden stroller to cherish each moment. A rare and unusual Edo Period example for the collector of exceptional pieces. 14 inches (35.5cm) high x 11 inches (28cm) wide. An extremely rare late Edo Period (circa 1860) Japanese albumin hand tinted photograph of a young foreigner dressed in a samurai's clothes. 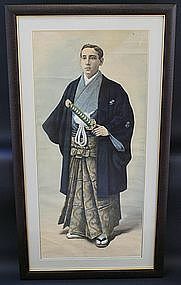 The art of portrait photography was brought to Japan in the late Edo Period by European photographers who first introduced photography to the Japanese. Westerners were fascinated by Japanese style and culture. They dressed up as Samurai and Geisha to pose for a photographic portrait. This early piece is a rare find for the photography collector. It is of artistic and historic importance. Image size: 41 x 18 inches, 104 x 46 cm. This stunning masterpiece of extraordinary design is an exceedingly rare Edo Period Botankago (Peony Basket) Ikebana Basket for the Tea Ceremony, with original signed box. One of the rarest and most important baskets to come up for sale. Black with a very large handle that separates into five pieces for portability, a fine complex weave and intricate crayfish motif. A rare and important find for the serious Japanese basket connoisseur. 22.5h x 19.25w inches, 57h x 49w cm. 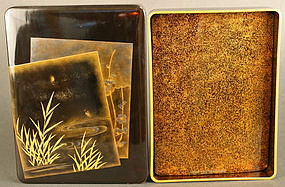 19th Century Meiji Period Japanese Black Lacquered Box with River, Bamboo, Flowers, and Fireflies. A gem of high quality with gorgeous fine details. 9.25 x 6.75 x 1.5 inches, 23.5 x 17 x 4 cm. Excellent Condition. From the collection of the Museum of Fine Arts in Boston comes this fine Edo Period late 18th/early 19th Century Japanese Black Lacquered Box with Mother-of-Pearl Inlaid and Gold Lacquered Boats in a classic wave pattern with exceptionally well rendered mother of pearl motifs. A rare masterpiece from all sides. 8 x 5.5 x 5.5 inches, 20 14 x 14 cm. Excellent Condition.